Natural blood thinners can help to prevent your blood from becoming too thick and keep blood clots from forming or getting larger. Some blood-thinning foods and supplements include turmeric, garlic, Ginkgo biloba, cinnamon, and omega-3. Also, some vitamins such as vitamin E and vitamin C help to improve your blood circulation and are good for your heart. Blood clotting is essential to prevent too much bleeding when you have an injury. However, if your blood coagulates too much, clots can form and may travel through your arteries and affect your heart, lungs, or brain. Blood-thinning foods, vitamins, and supplements can help to reduce the risk of serious clotting. It is important to know that natural blood thinners may not work as well as medication prescribed by your doctor. So, before you think about changing your blood thinner medication such as warfarin (coumadin) or Xarelto, you should consult with your physician. In this article, you will learn about foods, supplements, and vitamins that have blood thinning properties. You will also find out about any precautions when using natural blood thinning supplements. Natural blood thinners help to prevent blood platelets from clumping together easily to form clots. You may need to take blood-thinning medication if you are at risk of a heart attack, stroke, or deep vein thrombosis (DVT). Even though there are a number of natural substances that have anticoagulant activity, you shouldn’t view these as natural alternatives to blood thinner medication. Prescription anticoagulants or antiplatelet medication is usually required if you are at risk from blood clots. At the end of the article, you can find out about precautions you should take if you use blood thinning medication along with blood-thinning foods. 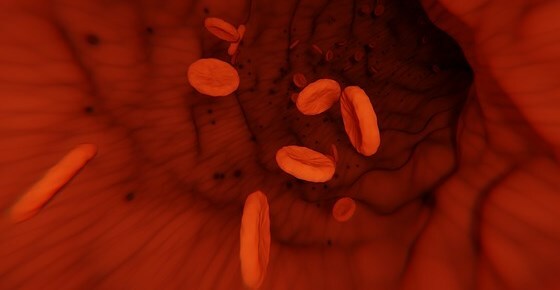 Let’s look in more detail at natural anticoagulants that can help to improve your circulation and keep your blood healthy. Turmeric contains compounds that have an anticoagulant effect and can help to thin the blood. The compound in turmeric with anticoagulant properties is curcumin. Curcumin is a well-known anti-inflammatory substance that has many health benefits. Learn more about taking curcumin for its medicinal benefits and why you should avoid using turmeric if you take blood-thinning medication. Ginger helps to “thin the blood” by helping to prevent platelets from sticking together to form clots. Learn more about the many health benefits of taking ginger to help relieve pain, lower inflammation, and improve your digestive health. Garlic can help to prevent clotting because it helps to lower clotting enzymes in the blood. Find out more reasons why you should add garlic to your diet and how this herb has powerful antibiotic properties. Taking vitamin E supplements can help to improve blood circulation and prevent clotting. Did you know that consuming foods rich in vitamin E promotes good skin health and may prevent the early appearance of wrinkles? Taking cayenne pepper may be a natural way to help treat thick blood and prevent platelets from clumping together. Helping to thin blood naturally is just one of the many medicinal uses of cayenne pepper. Learn more about how to use the spicy home remedy for pain, burning fat, and treating inflammation. Cinnamon has a compound that thins blood similar to popular pharmacological blood thinners. Find out how to use this delicious spice for its numerous health benefits and how to tell the difference between a stick of Cassia cinnamon and Ceylon cinnamon. Taking Ginkgo biloba may help to get rid of blood clots naturally due to its anticoagulation properties. Taking omega-3 supplements can boost your cardiovascular health and help prevent blood from becoming too thick. Find out more about the many reasons to supplement your diet with omega-3 fish oil. One way to treat thick blood is to regularly consume green tea. Consuming green tea every day not only benefits your heart health but can help you lose weight and boost your cognitive function. When consumed in moderation, alcohol can thin the blood and benefit your coagulation system. Drinking too much wine, beer, or spirits is also one of the bad habits that can damage your liver. There are many foods, supplements, and vitamins that help thin the blood to some extent. However, it is important to remember that it is difficult to dissolve blood clots naturally. Natural remedies to thin the blood may not be as effective as prescription medication. If you take blood-thinning medication to prevent a stroke, thick blood, or clots, you should take into consideration that natural substances can interact with drugs. Taking medicinal amounts of natural substances such as turmeric, garlic, or ginger along with prescription blood thinners can cause the blood to thin too much. This can increase your risk of bleeding. Usually, including foods such as garlic, turmeric, or cinnamon in your diet as a flavoring or spice will not affect prescription medications to thin blood. However, it is essential to consult with your doctor before taking herbal supplements while taking blood thinners.